It is a theological doctrine that God the Father loves all men and that God the Son manifests the love of God by coming to the world to die for our sins (John 3:16). It is a fact of history, visible throughout all four of our historical sources, the gospels, that Jesus of Nazareth was a man of strong affections who had special love for particular people. While Jesus would go off alone to pray (e.g., Mark 1:35), he was not in general a "loner." He was a man who had friends, loved his friends, and wanted to be with them. In this series, I continue to examine the unity of the personality of Jesus in the Gospel of John and the synoptic Gospels. In the previous entry I discussed several personality traits of Jesus that are constant across the gospels, including his being an emotional rather than a stoical person. This brings us to the particular way in which Jesus' affections were called out by his love for his friends. Here, too, we see that, pace the commonplaces of critical scholarship, the portrait of Jesus in John is not "very different" from the portrait in the synoptics. Rather, the documents present the same man, giving different instances of the same personality traits. I tell you, my friends, do not fear those who kill the body, and after that have nothing more that they can do. The passage is, in general, an attempt to strengthen the disciples to stand in the face of future persecution. Jesus stresses his personal relationship with his disciples in order to give them the courage they will need, a theme that arises a few verses later in John 15 as well (John 15:18ff). Jesus' affections could be called forth suddenly by a comparative stranger--something that happens to us as well. When the rich young ruler comes to Jesus, Jesus immediately feels drawn to him. In passing, I note something that I hope to return to in a later entry: It is often said that "eternal life" is a Johannine phrase and is used by John in place of "kingdom of heaven" in the words of Jesus. But in fact this is a matter of frequency of usage (on each side) rather than a general rule, and here we find the phrase "eternal life" not only used in Mark but even attributed to someone other than Jesus, raising the very real possibility that it was a phrase used in early 1st-century Palestine by Jews rather than an especially "Johannine idiom." There is apparently something about this young man that Jesus finds particularly lovable. It is often interesting to note how Jesus responds differently to people who come to him with questions. Sometimes he does not seem to think they are sincere. In this case, he sees the young man as sincere but as lacking something, and he puts him to a test which, as the story ends, he fails at that time, leaving one to wonder what happened to him later and whether he eventually joined the Christian community after Jesus' resurrection. Jesus' relationship with Simon Peter shows a special closeness. Scholars and preachers have noted, times without number, that Peter is impulsive and affectionate, greatly loving Jesus but in need of growth. The unity of the character of Peter and the coherence of his story across the gospels are yet more evidence of the historical nature and veracity of all four, John included. Here I want to note just a couple of the ways in which Jesus shows his special affection for Peter. Jesus predicts repeatedly that Peter will deny him, despite Peter's earnest assurances to the contrary. The inexorable, severe gentleness toward his dearly loved but imperfect disciple comes through here clearly. Interestingly, the "you" whom Satan has demanded to have to sift as wheat is plural in the Greek, apparently referring to all members of the group. But the "you" shifts to singular when Jesus talks about praying that Simon's faith may not fail. Jesus simultaneously predicts Peter's denial, shows his special love for him, and looks beyond the failure and suffering to Peter's restoration. And it is in John that we, and the other disciples, see that Peter has been restored and placed in a position of leadership after the resurrection, in the famous John 21 scene where Jesus repeats, "Do you love me?" and commissions Peter to feed his sheep. Even though Jesus knew from the beginning that Judas would betray him (just as he knew that Peter would deny him), the sense of that betrayal was heavy upon him. In John 6:70 he muses aloud, “Did I not choose you, the twelve? And yet one of you is a devil.” One might wonder why it should bother him so much. Surely he never had a real friendship with Judas, did he? Knowing as he did that Judas would betray him, would he even have sensed it as a betrayal? Yet he did. It made him sad. Nowhere is this sadness, born of his sense that friends should not betray friends, clearer than in the accounts of the Last Supper. Those clever critics who try to tell us that John fiddles with the Last Supper so as to make it different from the portrayal in the synoptics (claiming, for example, that it is not a Passover meal, since John is "moving" the day of the crucifixion in relation to Passover) are missing the highly salient similarities in the Last Supper between John and the synoptic gospels. One of these that seems seldom noticed is the atmosphere of pain and tension. It is on that same night that Jesus predicts that they will all leave him alone (e.g., Matthew 26:31-35, John 13:36-38). This is not a happy meal, though Jesus wanted to eat this Passover with them (Luke 22:15). This electrical scene is as vivid as anything in ancient history. Jesus, who has been deeply burdened all evening, predicts his betrayal. Peter gestures to the disciple whom Jesus especially loves to ask him who the betrayer is. Indeed, in this post I cannot pass by the mention of "the disciple whom Jesus loved," reclining next to Jesus at the meal and hence able to lean back and ask a quiet question, without noting how explicitly it supports my theme. Jesus has his specially beloved friends in all the gospels; this particular one is emphasized in John, most likely because that disciple himself was the author. See also John 19:26-27 for the commitment of Mary to this disciple, John 20:2 for his coming with Peter to the empty tomb, John 21:7 for his recognition of Jesus at the Sea of Galilee after his resurrection, and John 20:20-24 for predictions about his death and for his authorship of the gospel. Back to the Last Supper: Jesus, possibly speaking sotto voce to the beloved disciple, gives the signal--the one who will betray him is the one to whom he gives the sop after dipping it. He passes it to Judas. Jesus locks eyes with Judas and tells him, "Just do what you are going to do." Judas leaves. And the beloved disciple, perhaps the only one who knows what this means, notices that while the meal has been going on, it has become dark. Judas goes out into the dark. Last, let's turn to the picture at the top of the entry and talk about Jesus' friendship with Mary, Martha, and Lazarus--consistently portrayed in Luke and John. Luke apparently is unsure of the location of the home of Mary and Martha, and gives it in Luke 10:38 simply as "a village." But he then gives us a unique, famous vignette of Jesus' interaction with these friends. Here we find Jesus at his ease, welcomed into a home, interestingly listed as the home of Martha rather than that of Lazarus, who is not named here. Notice here the knowledge of Martha's character and of Mary's and the love for both. Notice, too, the idiomatic repetition of Martha's name. Where have we seen that before? In the words to Peter: "Simon, Simon, Satan demanded to have you (pl.)..." And where else do we see repetition like this at the beginning of a saying from Jesus? Ah, yes, in that supposedly "Johannine" repetition in so many places in John, "Truly, truly, I say unto you..." (John 1:51, 3:3, 5:19, 6:32, 16:20, and more.) Maybe Jesus really did talk like that after all! And in the entire scene that follows, where Jesus delays, then comes to Bethany only after Lazarus is dead, meets with Martha, and eventually raises Lazarus, the characters of Mary, Martha, and Jesus, and his love for them are played out just as one might have expected from the short scene in Luke. Who first goes to meet Jesus? Martha, the stronger, more confrontational sister. When Martha says to Jesus, "If you had been here, my brother would not have died," she follows it up with an implicit request for him to do a great miracle. Jesus tells her that her brother will rise again. She is afraid to believe it and says that she knows he will rise again at the last day. Jesus utters the famous saying, "I am the resurrection and the life." (Not in a "long discourse," but in the course of a painful dialogue with a grieving woman.) She tells him that she believes he is the Christ and goes to fetch Mary. To Mary's tears, the only possible response is weeping in sympathy...and action. Martha, the ever-practical, the blunt, makes one more comment at the grave, daring to object, on the grounds of smell, to the Master's command to open the grave. But Jesus knows what he is doing and how he is about to show his love for his friends. 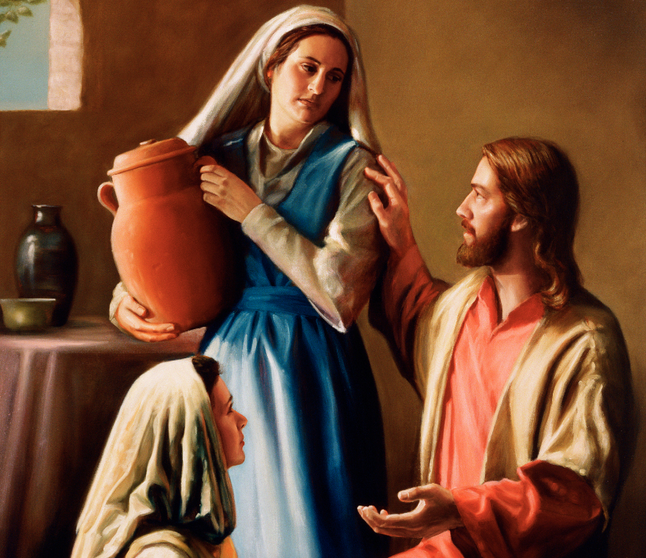 There is one more scene involving Mary and Martha in John--the anointing in John 12. From the synoptics (e.g., Mark 14:3) we have reason to believe that this meal did not take place at the home of Mary, Martha, and Lazarus, though it was in their small village. John 12:2 says, "Martha served." And indeed she would! We have not previously seen Martha serving in the gospel of John, but we certainly did in the gospel of Luke. Her character is consistent throughout. Even at the home of Simon the "leper," Martha gets in on the practical side of things. Mary, too, is consistent. She isn't serving. Instead she comes and pours out a jar of costly ointment on Jesus' feet. (One can only imagine what Martha thought of that!) This time (according to John) it is Judas who rebukes her, and Jesus once again, in both John and the synoptic gospels, takes her side, saying (in the synoptic Gospels) that what she has done will be told throughout all the world in her memory. Jesus and Mary of Bethany understand one another very well. These are Jesus' friends. Flawed but loving Peter, whose whole life Jesus sees spread out before his knowledge; Mary, Martha, and Lazarus, each of whom he knows intimately. The special disciple Jesus loves, who flees in the Garden briefly but returns and follows all the way to the cross. The rest of his closest disciples, to whom he gives a new commandment after Judas leaves the room--that they love one another. Even the rich young ruler, whom he meets only briefly and yearns over with a sudden pang of affection. And then there is evil Judas, who should be his friend but is not and whose foreseen betrayal causes him pain throughout his ministry. Behold this man, Jesus. The man of sorrows and acquainted with grief, whose love for his friends is no small part of both his sorrow and his joy. This man, the same throughout, is the one revealed to us historically in every gospel we have been given. This is wonderful! Not merely in terms of making a definite and solid argument in favor of the reliability of John as witness reporting, but also in terms of making Jesus more known. Jesus was truly man, not a god who put on the outward clothing of a man and was just going through the motions of human action. Pretty sure he raised his voice here, but there is no explicit indication. Both writers only report it as "he said" and "he told". Yes, very seldom are we told that Jesus spoke in an especially loud voice (on the cross is one instance when he "cried in a loud voice," and there might be one or two more place), and I don't think we're ever told that he lowered his voice. That's just one way in which the literary form is not developed with all of the kinds of realism we take as a matter of course in modern works. So, can we compare to other literature of the times? Did the Greek playwrights put in instructions for "shout" and "whisper"? Did Virgil vary the charaters' speaking voices? Did Tacitus, or Thucydides, or Plutarch, or Josephus? I've been reading a fair bit of Plutarch and saw no whispers, though "in a loud voice," "in loud tones," etc., does occasionally occur. Crowds are often also said to be loud. Similar to the gospels in that respect.